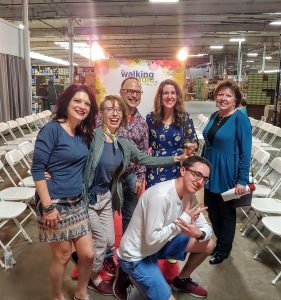 Last night, I attended Walking Cradles 2019 Spring Shoe Stravaganza and I got to meet Jodie from Jodie’s Touch of Style while she was in town from Denver. I’m in love with their Spring collection of shoes. 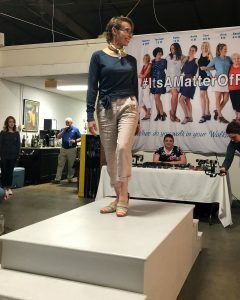 Watch the FB Live Video HERE and you’ll see Jodie sharing some of her favorite Spring styles down the red carpet. Today is the last day you can Save 20% off all Spring shoes except the Stardust & Shea which is 40% off! You also get free shipping today. Jodie’s husband Rob filmed the Facebook Live on the Forever Fierce Facebook page. Jodie is famous! 🙂 I was excited to meet her, she was exactly how I pictured her in person as she portrays herself on her blog. Super sweet, easy to talk to, fun and stylish! If you could work with any brand, who would it be, and why? I’d love to work with Nordstrom, of course! 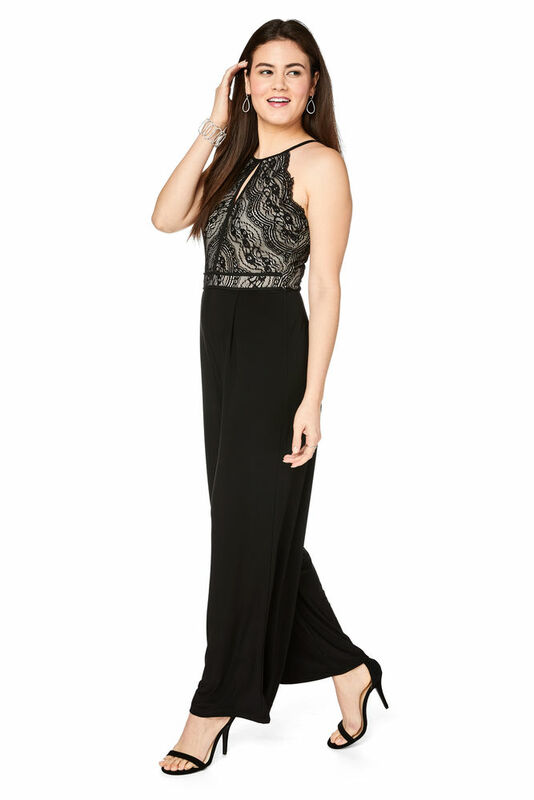 Charming Charlie would be fun… or I love how some bloggers have been able to design their own clothing line. That would be a dream! Arhaus Furniture would be nice… especially since I could use some updated furniture! 🙂 And… Disney or Disney Cruise Line would be a dream! So, you’ll see that she asked if we could work with any brand, who would it be? I answered that one of the brands would be Charming Charlie. Well, a week later I had an email in my Inbox from Charming Charlie, mentioning that they saw my post and that they’d love to collab with me. I was BEYOND excited and felt so blessed they reached out to me. I’ll be sharing the post next Thursday and will be sharing this darling jumpsuit with a scallop detail on the lace bodice. 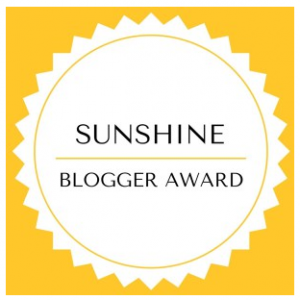 I’ve had a few special mentions and blog projects this month. 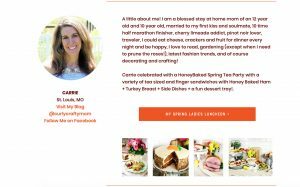 One of them was a blog collaboration with The Honey Baked Ham Company and I didn’t know they were going to do a little blurb with a call out to my post and some other bloggers that worked on their Spring campaign as well. Recently, Kelly Ann at This Blonde’s Shopping Bag mentioned the site Fohr and how you can create a media kit on it and much, much more. 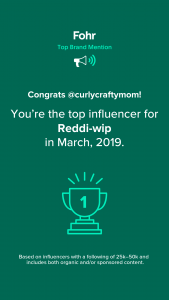 I was surprised to receive an email from Fohr recently that I was the top influence for Reddi-wip. You can see my Instagram post HERE. Here is what that means: we track over 4,500 brands to see which influencers are giving each of them the most coverage on Instagram. Then, we rank those by the number of impressions (number of followers x number of posts) they dedicate to those brands over a given month. Finally, we look for the top influencer across 8 following ranges and send them each, well, this email. Kinda interesting, right? If you haven’t checked out Fohr yet, be sure to check them out! Getting myself an iced Starbucks on a morning that isn’t particularly busy is always nice. I can unwind, drink it slowly and let the day set in. I’ll eat white chocolate, but I’m really not a big fan of it. Milk chocolate is probably my favorite. Dark chocolate is good on strawberries or I enjoy dark chocolate sea salt caramels. I don’t really have a favorite type… I listen to a lot of different types of music. Probably somewhere warmer than the midwest. 🙂 Although, I have naturally curly hair, so I am not sure if if the warm weather would be worth having frizzy hair all the time! Ha! I’d love to live in Paris or somewhere in Europe for a month. I’ve told Brian we need to do that someday when he retires. More than likely, I’d spend it on remodeling a room in the house or on new couches. We reallly could use new couches in our family room. The kids destroyed them when they were younger! I’ve always wanted to be asked to travel somewhere fun for a collaboration for my blog. Or, a dream vacation somewhere that I’d be asked to blog about in return for my travel fees. I feel like I’m so bogged down with the kids, I’m not sure how I’d ever get away… but, I’d figure it out quickly! Lol! I go back and forth on this… I don’t know what I’d do if I didn’t blog. It’s a good outlet for me. But, sometimes it can become really overwhelming as I try to juggle it with the kids and everything else. I really enjoy the friendships. I’m thinking about traveling to a bloggers conference that I’m interested in attending next year by myself. Although, I’m going to try to talk some bloggers into going with me! Ha! Christmas Day. I enjoy the special moments, family time and the remembrance of Baby Jesus. However, everything that goes in before Christmas is truly exhausting. Ever since getting my new car with its upgraded technology from my 2007 car, I’ve been enjoying some new things while driving… such as audio books!! I thought it’d be fun to read some self help books while driving, since these seem to be the easiest for me to really focus on, since I have no distractions in the car. I spend a lot of time driving the kids back and forth to school and I’ll listen to it after I drop them off or on my way to get them or while running errands. 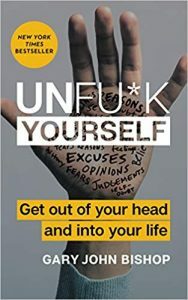 The first book I chose was Unfu*k Yourself: Get Out of Your Head and Into Your Life by Gary John Bishop. This book has been really helpful for me as I tend to overthink everything. I’m always running thoughts through my head. And, they’re not always good ones. The book helps you to channel these thoughts into positive and functional thoughts and to stop thinking or having expectations about what you can’t change or what you aren’t in control of… that you’re in control of your thoughts unless you let them control you. This is just the gist of it, but I really enjoyed it. It’s fairly short, so you can listen to it in just over 3 hours. Gary John Bishop reads it himself and he has a humorous Scottish accent. There is a little bit of bad language in the book, but it isn’t too bad. 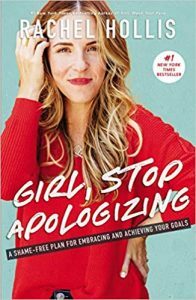 I’m currently on my second audio book and it is Girl, Stop Apologizing by Rachel Hollis. This is her second book and I read her first book last year (Girl, Wash Your Face). I’ve been enjoying it so far, especially since she reads her book herself. There are a lot of great ideas I’ve taken away in the book so far, such as setting aside just 5 hours a week to work towards a goal you’ve been pushing off FOREVER. Taking 5 hours out a week may seem hard, but what if you broke it into a 3 hour chunk and a few 30 minute chunks? Ideas like these have really help to motivate me. I try to hit the outlet mall a couple of times a year in the Fall and Spring. There are two outdoor outlet malls just outside St. Louis fairly close to each other and I usually go to the smaller one. I went to the larger one this week and I only had a couple of hours to shop and man, I could have shopped longer! 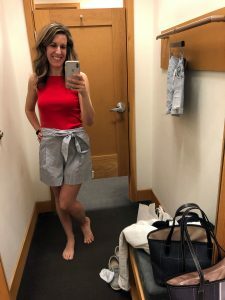 I agreed to meet my husband for lunch and of course, that is way more important to me than shopping… but, man… I wish I had more time in my day to shop (says every woman, right?!). Found this adorable workout outfit at Gap Outlet. 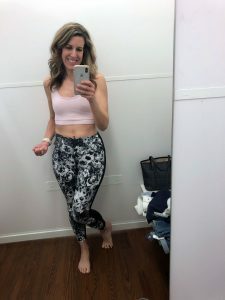 I really need new workout clothes! 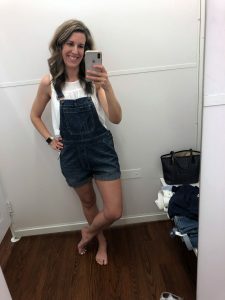 I’ve been wanting a pair of overalls and I tried this set on at Gap Outlet and fell in love! The white tank is from Gap Outlet as well. 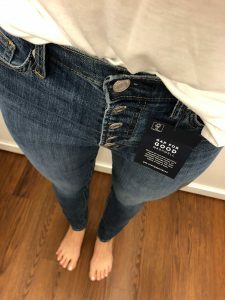 One item I was really wanting to find on my shopping trip was a pair of button fly jeans. Score! Gap Outlet. These blue and white striped shorts were a super cute find at J. Crew. I had to have them! I love that the fit is comfy, the length is a little longer and it has a cute tie waist! I paired a red hot tank with it! I went to the outlets on Monday and that is a Low Carb day for me with FASTer Way. 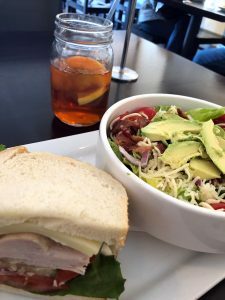 Brian met me at Russells and we both had a turkey sandwich and salad. Yum!